Sawtooth Conference "Coach of the Year" Lane Kirkland of Carey tops the list of All-Sawtooth selections announced last week after the completion of Milk Bowl football playoffs in the Gem State. Tenth-year Carey coach Kirkland led the 2010 Panthers (11-1) to the State 1A Division 2 eight-man championship with three playoff wins including the 62-36 championship game victory over Garden Valley Nov. 20 at Eagle High School. Carey outscored opponents 538-116 and posted the school's record-setting fifth Idaho eight-man state title. 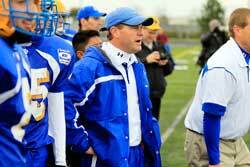 Kirkland has won three of those as coach, in 2006, 2008 and now in 2010. His Panthers picked up the lion's share of the All-Sawtooth honors with 11 first-team selections, six on offense and five on defense. In all, 10 different Carey players earned All-League mention on either the first or second teams or honorable mention by position. Senior co-captain Blair Peck was chosen Sawtooth North Division first team as kicker, defensive line and offensive guard. Senior co-captain Caleb Cenarrusa also was chosen three times—first team as quarterback and punter, and second team as defensive back. Other Panther first-team picks were senior Shane Bingham offensive end and defensive back, senior leading scorer Tim Hoopes running back and linebacker, junior Chance Chavez center, and sophomore Glen Andrews defensive end. Second-team selections included Carey juniors Charlie Rivera and Dillon Cenarrusa, sophomore Garrett Lee, and sophomore Francisco Gamino. Camas County junior Jacob Hansen was a second-team North selection as center, with Carlos Robles making honorable mention as punter. Quarterback—First team: Caleb Cenarrusa (Carey). Second team: Alex Heimerdinger (Dietrich). Honorable mention: Dustin Rosenkrance (Mackay). Running back—First team: Tim Hoopes (Carey) and Dion Norman (Dietrich). Second team: Charlie Rivera (Carey) and Cadin Betzer (Mackay). Honorable mention: C.J. Barnhardt (Mackay), Dillon Smith (Clark County) and Javier Figueroa (Clark County). Center—First team: Chance Chavez (Carey). Second team: Jacob Hansen (Camas County). Guard—First team: Blair Peck (Carey) and Dallin Pearson (Mackay). Second team: Garrett Lee (Carey) and Grey Weber (Dietrich). Honorable mention: Tucker Farr (Clark County) and Jakob Howard (Dietrich). Ends—First team: Shane Bingham (Carey) and Zach Foster (Mackay). Second team: Andru Howard (Dietrich) and Dillon Cenarrusa (Carey). Punter—First team: Caleb Cenarrusa (Carey). Second team: Dustin Rosenkrance (Mackay). Honorable mention: Carlos Robles (Camas County). Defensive line—First team: Blair Peck (Carey) and Dallin Pearson (Mackay). Second team: Tyler Cenarrusa (Richfield) and James McDaniel (Dietrich). Honorable mention: Francisco Gamino (Carey). Defensive end—First team: Glen Andrews (Carey) and Jakob Howard (Dietrich). Second team: Charlie Rivera (Carey) and Andru Howard (Dietrich). Honorable mention: Tucker Farr (Clark County) and Zack Foster (Mackay). Linebacker—First team: Tim Hoopes (Carey) and Grey Weber (Dietrich). Second team: Chance Chavez (Carey) and Dion Norman (Dietrich). Honorable mention: Dillon Smith (Clark County) and C.J. Barnhardt (Mackay). Defensive back—First team: Shane Bingham (Carey) and Alex Heimerdinger (Dietrich). Second team: Caleb Cenarrusa (Carey) and Dustin Rosenkrance (Mackay). Honorable mention: Brody Astle (Dietrich), Javier Figueroa (Clark County) and Dalton Lords (Mackay). Kicker—First team: Blair Peck (Carey). Second team: James McDaniel (Dietrich). Quarterback—First team: Kale Weekes (Castleford). Second team: Austin Stanger (Murtaugh). Honorable mention: Tyler McLain (North Gem). Running back—First team: Matt Nelson (Rockland), Cody Quinn (Castleford) and Humberto Pacheco (Murtaugh). Second team: Adam Machado (Castleford), Merrill Hall (North Gem) and Lizandro Sosa (Murtaugh). Honorable mention: Cody Hidalgo (Rockland) and Cullen Fightsover (Sho-Ban). Center—First team: Austin Permann (Rockland). Second team: Logan VanderStelt (Lighthouse Christian). Guard—First team: Dylan Kelly (Rockland) and Zach Frey (Castleford). Second team: Quentin Van Pelt (North Gem) and Nate Gonzalez (North Gem). Honorable mention: Marcus Bott (Rockland) and Telson Jake (Sho-Ban). Ends—First team: Tyler Hansen (Castleford) and Tanner Kirby (Rockland). Second team: Brad Wall (Lighthouse Christian) and Tyler O'Brien (Rockland). Punter—First team: Dalton Duba (Rockland). Second team: Tyler McLain (North Gem). Defensive line—First team: Zach Frey (Castleford) and Cody Hidalgo (Rockland). Second team: Jose Orozco (Lighthouse Christian) and Tyler Hansen (Castleford). Honorable mention: Lizandro Sosa (Murtahg) and Telson Jake (Sho-Ban). Defensive end—First team: Dalen Barfuss (North Gem) and Tanner Kirby (Rockland). Second team: Pablo Perez (Jackpot) and Seth Newbry (Lighthouse Christian). Linebacker—First team: Merrill Hall (North Gem), Cody Hansen (Castleford) and Matt Nelson (Rockland). Second team: Humberto Pacheco (Murtaugh), Adam Machado (Castleford) and Mitch Howard (Castleford). Honorable mention: Austin Stanger (Murtaugh) and Ty Colton (Rockland). Defensive back—First team: Tyler McLain (North Gem) and Kale Weekes (Castleford). Second team: Clayton Kline (Castleford) and Tyrell Turley (Rockland). Kicker—First team: Cody Hansen (Castleford). Second team: Austin Permann (Rockland). Honorable mention: Fin Brauer (Lighthouse Christian).